A little health and fitness review today! 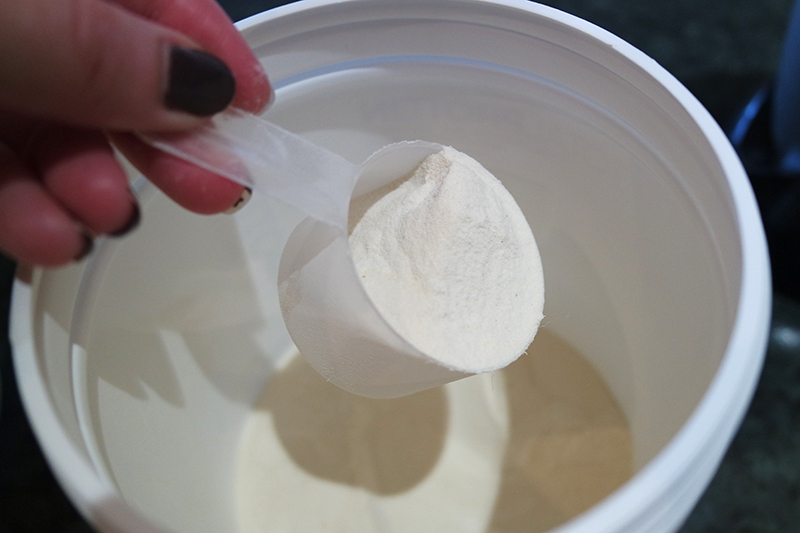 I recently got the opportunity to try BodyLab's Total Protein Vanilla Shake*. I was excited to try BodyLab's products as they are created especially for women. Their range of protein-packed formulas don't contain any added creatine - which means they don't promote the building of bulky mass, or play havoc with your hormones. I'm currently on a bit of a pre-wedding health kick so adding in an extra protein source to my daily routine amongst my increased level of exercise gives a great boost to my efforts. 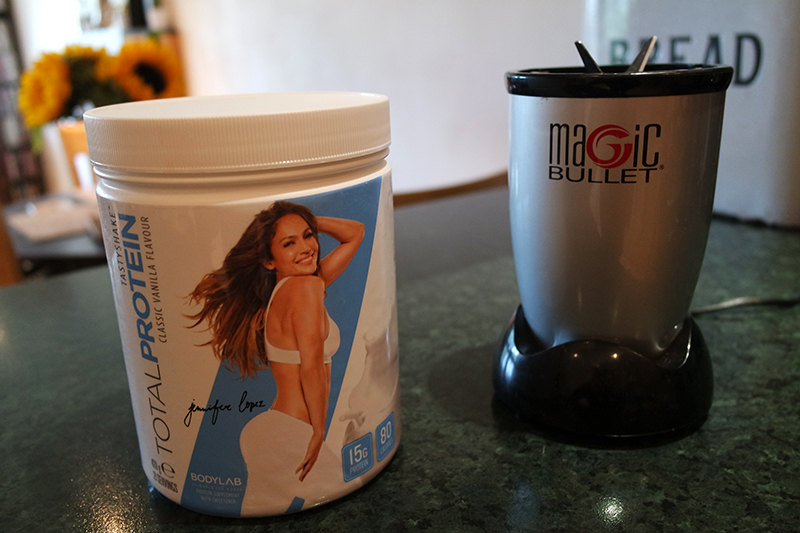 Heralded as "simply a unique blend created with plant-based compounds to help you burn through excess body fat, get lean, and feel amazing" and endorsed by none other than abs-of-steel goddess, Jennifer Lopez, I was ready to begin! To fully disclaim, I've been mostly using these shakes as meal replacements for a quick breakfast or lunch. To make them more filling, I've typically been blending the protein powder with a milk substitute like almond milk, hazelnut milk or coconut-based milk. My go-to brands for these are the Alpro and Almond Breeze varieties which are typically available in most big supermarkets. I found this protein powder fairly sweet (as opposed to some others I've used previously like Juice Plus and Purition) so I found that I only needed to use the unsweetened versions of the milks. At only 80 calories a shake (if made simply with water), it's great that sweetened additions aren't needed. I like to mix up my shakes so I often like to blend them up with fruits too. Bananas are always great and I've recently liked picking up frozen berries too. The frozen raspberries I've used below are from Aldi - they are a great alternative to fresh ones and it means you can use them whenever you like with no wastage! 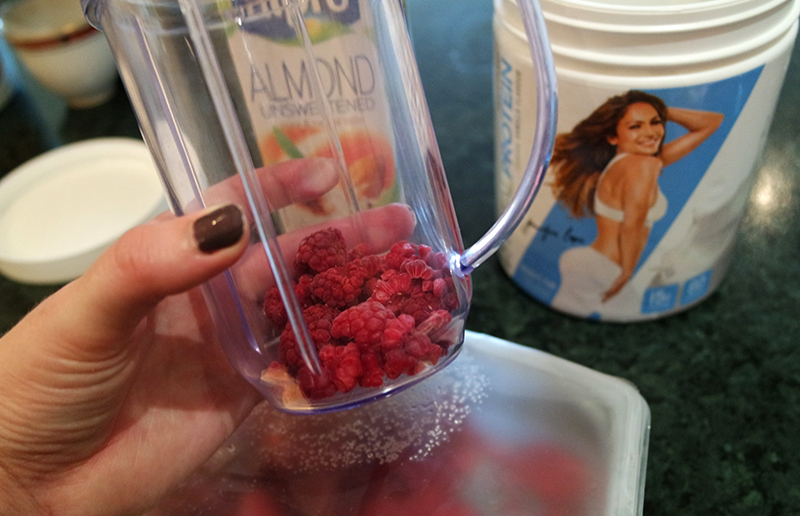 I find it best to put the raspberries in first and leave them in a little of the almond milk (or water if used) to defrost slightly; it just makes them a little softer for blending. 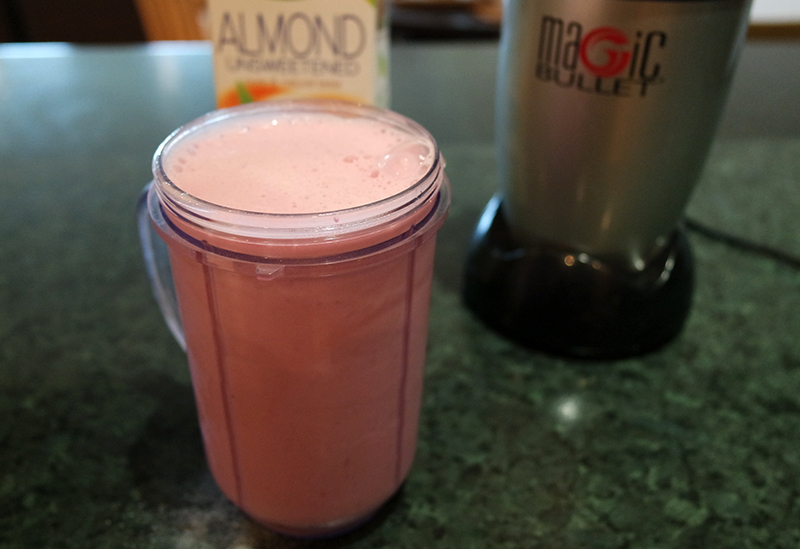 I use the Magic Bullet for my shakes - it's made by the same people as the better-known NutriBullet. It was much cheaper and though it's not quite as powerful, it does come with lots more useful attachments. I have no complaints whatsoever about it and would definitely recommend it to a shake or smoothie newbie! Something else I like to add to my shakes (though it didn't go into the one above) is an almond butter for a slightly nutty taste (and peanut butter isn't my thing). 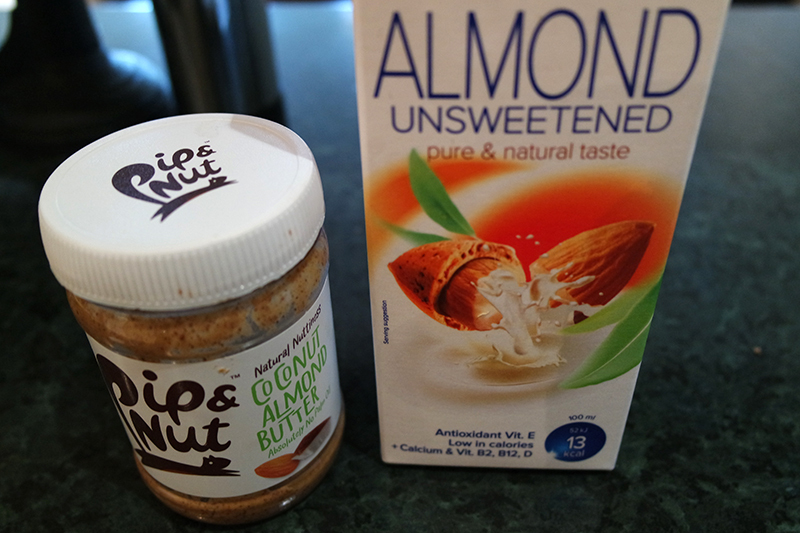 My favourite has to be Pip & Nut's Almond and Coconut Butter. You can definitely taste the coconut which also adds a nice sweetness - I got mine from a health food website but I'm sure I've since noticed it in some supermarkets and high street chains so I'd definitely recommend looking out for it. Overall, I really liked Body Lab's shake! 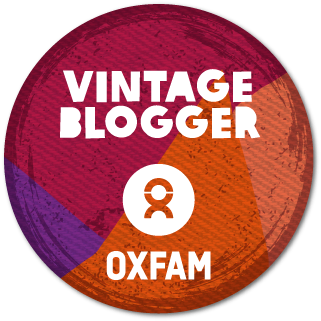 The vanilla flavour is subtle and sweet - though not too sweet; nor does it have that really fake chemically sweetness that some powders have. Even though at 80 calories (without the calories in the milk), I found these shakes surprising filling! 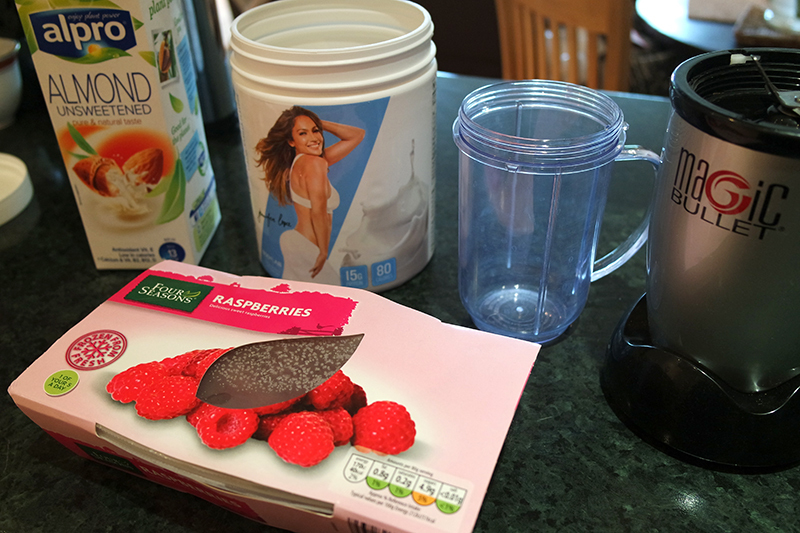 A shake like this one for breakfast easily kept me going until lunchtime - even after a workout! I often make a big shake and might drink half for breakfast and put it the fridge and have the rest for lunch. I did find that these didn't keep so well and sometimes 'split' after being in the fridge. Though I'd say most protein shakes are best made fresh each time and this isn't the ideal thing to do anyway. Overall, I really enjoyed trying these shakes and think that packing 15 grams of protein into an 80 cal, great tasting shake is pretty impressive work. 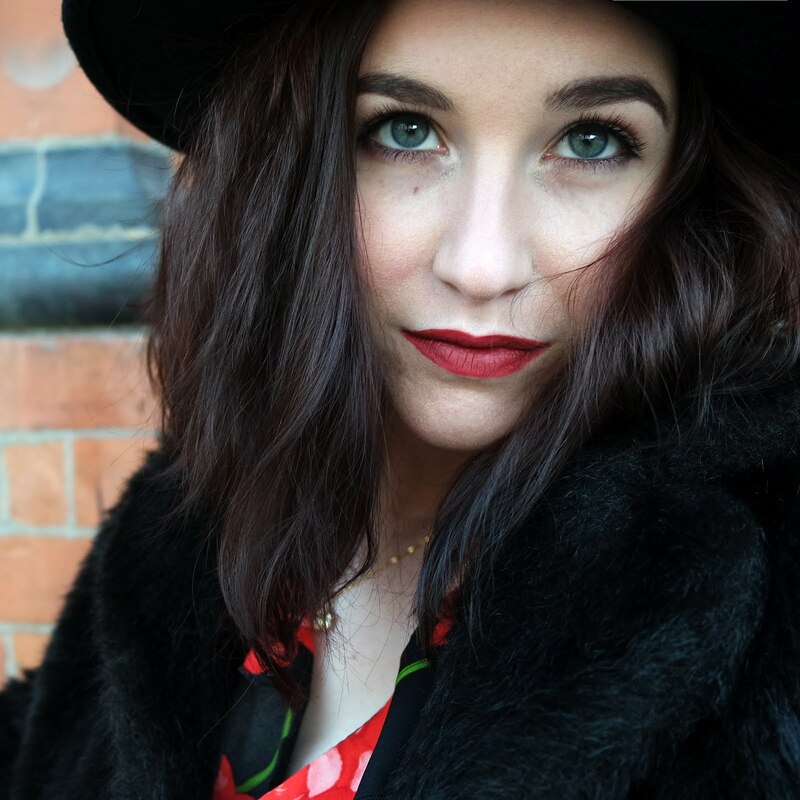 I was worried that the product would taste a bit 'fake' as it's not marketed as a 'natural' product - however after looking at the ingredients, they are surprisingly free from nasties. I'd definitely recommend BodyLab products to any women looking to introduce a little protein boost into their health and fitness routine! 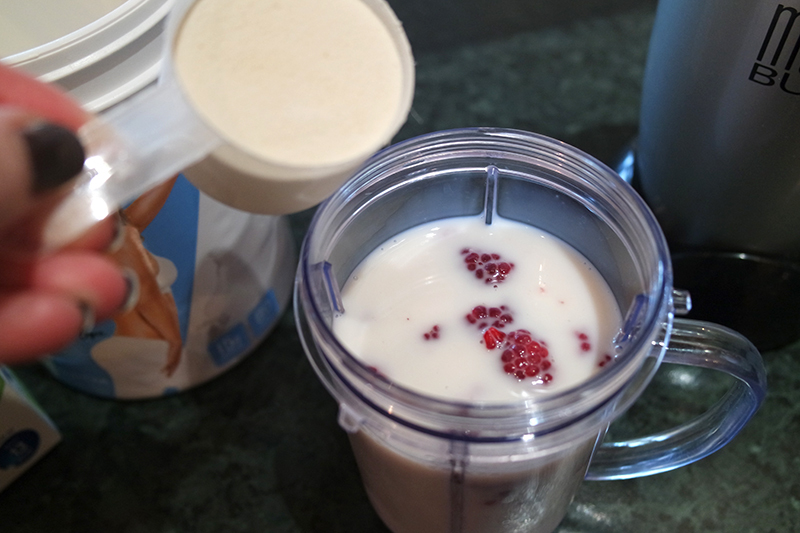 Do you use protein shakes alongside your workouts? 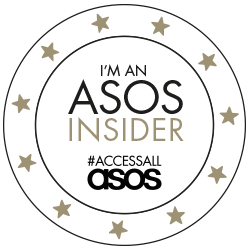 What's your favourite brand?